Sometimes free apps aren’t enough to fulfill all our needs. In fact, premium apps that are available on Google Play Store can actually bring some unique features. Therefore, we have composed a wonderful article on best paid Android apps 2019. We’ve listed the best 25+ Android apps which will enhance your overall Android experience for sure. Android mobile is very advanced and all of us know Android is owned by Google. Google provides it’s Play Store to download and install apps for Android. With these apps, you can effortlessly customize your Android device. These apps play the important role in our daily life for example – Whatsapp, Facebook, and twitter etc and have become part of a day to day life. In the Google Play Store, there are free apps and some paid apps too. Most of us only use free Android apps but there are some paid apps which are very fashionable and have pretty interesting features and uses. Actually, these apps are paid because their developer wants to have money for downloading its app. Developers set the app price on Google Play Store and Google takes that amount from a user and then allows them to download and install those apps on their Android device. Now in this post, we’ve listed the Best Paid Android Apps 2019. You will surely like these apps as these apps have reasonable price according to their benefits. SKRWT is the most powerful perspective- and lens correction tool out there. Crafted to help you enhance your best smartphone photos in just a few taps. This fine application is the go-to editing tool for sophisticated photography enthusiasts like yourself. SafeInCloud Password Manager allows you to keep your logins, passwords, and other private info safe and secure in an encrypted database. You can synchronize your data with another phone, tablet, Mac or PC via your own cloud account. The name says it all, it has the variety of features which includes total automation, from settings to SMS. You can schedule various tasks on your Android device using this app. You can access over 28 system settings dialogs. You can schedule to turn on/off Flight mode, Bluetooth, Wifi using Tasker. Vocabulary.com app helps you master words through a fun and addictive game. And it’s powered by the world’s smartest, fastest dictionary. This app will expand your vocabulary with lightning speed! Sleep as Android is a smart alarm clock with sleep cycle tracking. Wakes you gently in optimal moment for pleasant mornings. This is one of the best paid Android apps. It provides a feature to customize the notification light color. It supports about 600+ notification styles in it. You can easily customize your notification alert area with this app. The update includes Redstone Circuits, Desert Temples, Rabbits, and more! Minecraft is a game about placing blocks and going on adventures. Nova launcher Prime is from TeslaCoil software which is one of the top developers on Google Play store. Unlike another launcher, this app comes up with few extraordinary customizations which really change the overall look of the phone. It is a must buy app for those who spends lots of time installing the various launchers. This is best Android Keyboard of all time. It provides an easy attractive interface between user and device while typing. Also, we can select some particular word on sketching some particular design in this keyboard. This is one of the best paid Android apps. It allows you to change your Android device into a mobile hotspot. FoxFi/PdaNet shares your phone’s internet with your computer or tablet through USB, WiFi Hotspot or Bluetooth. That will save you a $30/month tether plan. No rooting is needed. Like Instagram, this app provides papers effect on your pictures. This app offers real-time cartoon and painting effects displayed on your camera feed so you can see the world through a different lens and your picture too. See the world through a new, original, stylish and captivating lens, have a wonder in your own home and discover how cool is now your world in cartoon! Take pictures and record videos using any of the stylish cartoon effects or apply them to your existing photos. Many of us know about this app for sure. This is the best music player app available on Google Play store. It is fast and has a stunning look to attract users. It comes up with unique equalization system that makes you feel out of the world while listening any music. This is the paid app but you can get the free 15 days trial version to try it out before you decide to buy. Get all the future updates for free: Once you purchase Poweramp, all the future updates are free to you as long as you have the Unlocker. Have a dedicated music player: Poweramp is dedicated to being the best music player available, and we will never change from that. Poweramp focuses on doing nothing more than being a great music player. This is one of the cool paid Android apps which allows you to play this cool SNES game. You can easily locate and play your favorite titles by scanning your phone to view your list of installed ROMs! Race as Sonic and Tails through high-speed environments such as Casino Night and Chemical Plant. An all new ‘Boss Attack mode’ challenges the player to defeat all of the game’s devious bosses in one run. For the first time ever explore the mysterious Hidden Palace Zone. Enter multiline GameShark/ActionReplay/CodeBreaker cheat codes and enable/disable them on the fly while the game is running. High-level BIOS emulation. No BIOS file needed. OpenGL rendering backend, as well as normal rendering on devices without a GPU. Cool video filters through the support of GLSL shaders. Minimal, classy, extremely customizable, and battery friendly “Do It Yourself” widget with almost limitless possibilities! This app lets you create your own custom widget for almost anything. Build your style and change everything: color, text, shapes, position and more! If you love podcast then Pocket casts is undoubtedly the best thing you can ever have on your phone. Pocket casts let users toggle between video and audio podcasts with ease. This is one of the advanced camera apps you can have on your smartphone. If you love to click photos then this app will bring you manual controls for ISO, white balance, exposure, shutter speed and much more. The one-and-only remote control app for your computer. Turns your device into a WiFi or Bluetooth universal remote control for Windows PC, Mac, and Linux. Preloaded with support for 90+ programs including mouse & keyboard, media players, presentations, screen mirroring, power control, file manager, terminal, and much more. Easy server and app setup, that just works. Automatic server detection to easily find servers on your network. Server password protection and encryption for added security. Supports single and multi-touch mouse control. Wake On LAN to easily start your server. Includes light and dark color themes. Nova launcher is also available in free version. However, you will never know the full potential of this launcher until you purchase the prime version. The prime version brings some extraordinary features to your Android smartphone. With this editor, you can create your own designs and display any data you want, at once, and with some wonderful animations too. This is another awesome android app you need to have on your smartphone. Are you bored trying different widget on your Smartphone? Need to try something fresh? Zooper Widget will be the best choice for you as you can create your very own custom widget. After MX Player, nobody uses the stock Android video player. MX Player free version has the capability to run almost every video format on a smartphone. The free version is basically an ad-free version. However, it also brings some feature like gestures, HW and SW acceleration, Multi-code decoding etc. Well, without any doubt, 1Weather is by far the best weather app which you can have on your Android smartphone. The app can show you the current weather information and forecast for up to 12 weeks. The premium version of the app also shows extended information like storms, humidity, precipitation forecast and much more. Track current conditions and forecasts for your location and up to 12 locations of your choosing. Easily share weather conditions with your friends via email and social media. Pulse SMS is a seriously beautiful, next generation, SMS and MMS app that is fast, secure, and packed with all the features and customization you could want. The messaging app brings theming, GIF Support, password protected conversation, blacklist for spammers, dual-sim support and much more. Solid Explorer is one of the best and advanced file manager app that you would love for sure. The app brings Material design, archive support, cloud services, and more powerful stuff like FTP, SFTP, WebDAV and much more. The app offers 14-day free trial, and after that, you need to purchase the premium version. You can also use the app to open hidden folders of Android. 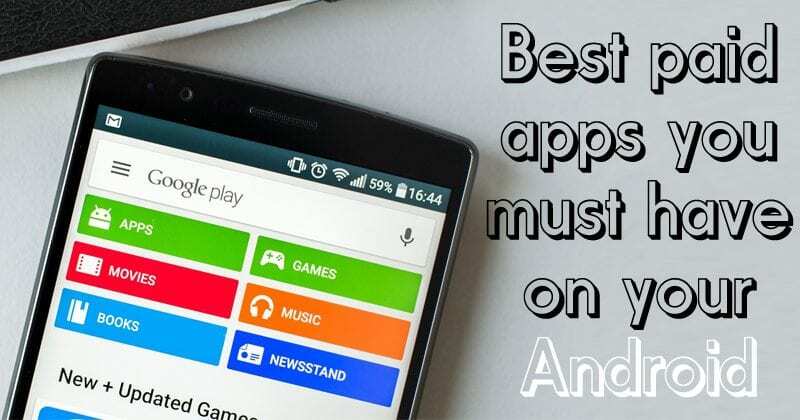 Above is the Best Paid Android Apps 2019 which you should buy, download and install on your Android devices. These apps will undoubtedly give you a great experience. Also, these apps will help you a lot in customizing your Android. Don’t forget to share this post. Tell us your favorite Android app in the comment box below.